I am one of those people who actually loves to shop. One who can lose ones self in a shopping centre, spending hours looking at what each store has to offer. I am also one of those people who hates crowds. So, December is a very trying time for me. I spend as little time in the shops as possible, as they are always full of people. This is good for our local stores but not for me! I keep a running shopping list of what I need and when I am desperate for one item on the list I pack my shopping bag with my wallet and phone and walk the block down to the local Woolworths. The other day some gentleman (and I use this term loosely) was shopping with his child. They took up an entire aisle, without leaving space for anyone to pass. The first time this happened I waited patiently and they ignored me. The second time I actually said something! And to make it worse, they had a staff member assisting them in blocking the path. My usually pleasant shopping experience was anything but pleasant with having to navigate my way through crowds of people who are oblivious to others. When making Floating Islands you have to give the meringues space to poach. I did mine one at a time, not crowding the pan in any way to allow each fluffy white pillow of egg white to poach slowly and gently. The custard is made with a lot of sugar which makes it overly sweet when eaten alone, but with the snow egg added on top, the dish is perfectly balanced. 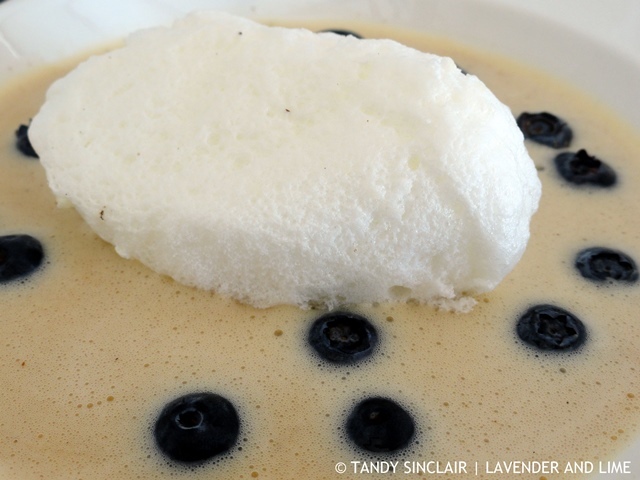 These floating islands need a sweet custard to achieve the perfect balance in taste. Blog-checking lines: The January Daring Cooks Challenge will ensure that no matter where in the world you are, you will have a bit of snow! Kim from Ask a Foodie challenged us to make Ouefs à la Neige, or “Eggs in Snow”. Are those blueberries in your pudding? I like the “crowded” analogy of you in the shopping aisle and your meringues. Looks delicious. Yeah, I’m one who loves to shop too… as long as it’s for groceries. I can spend hours in a grocery store, although, it doesn’t usually take that long. I’m not much of a shopper other than that. For everything else I just dash in and out. I cannot stand lots of crowds either. Guess I’m like this meringue? This looks marvelous! Love those floating islands. I’ve never heard of this, but darnit if I don’t like it :). Wow, such a long time since I made these, Tandy… thanks for the delicious reminder! We have some great village like shopping centres five minutes from The Blue House, so it’s quick and convenient to pop up there… but both Peter and I hate it when the stores are crowded… being retired, we try to pick the ‘sweet spot’ in the day when mothers aren’t there with screaming kids… though now it’s the holidays, there is no quiet time. Lovely recipe. Thanks. Oh, Floating Islands, haven’t made these forever – probably the last time was a practical exam at Uni and that’s probably why! Yours do look very pretty – Tandy. I was a Londoner, born and bred (as they say) so I too don’t mind the crowds too much. This post took me back over 25 years to one of my very first “proper” dinner parties in my early 20’s. I made duck with blackcurrant as a main course and floating islands as my dessert….not sure I’ve made either of them again since, perhaps I need to! It’s been ages since the last time i had floating island!!! you made me craving on it again my friend….. I don’t do much online shopping! I love Iles Flotante. Just watched an episode of the Great British Bakeoff and the island were the technical challenge. It stumped many! Oh boy this looks good! I also hate the crowds and oh my goodness living in HK has been a challenge living with 8 million of your closest friends. I think after 6 years it is starting to not bother me as much. You kind of get used to it. I would never cope for too long in a big city! Oh not big on shopping, but dont mind the crowds. Weird I guess. Gah, some people really are very rude, sorry your shopping experience was interrupted by that. Great recipe, love the name of it.